Most hotel loyalty programs allow you to convert hotel points to airline miles. But airline miles are normally more valuable than hotel points (with the notable exception of the SPG program), so transferring points to miles is usually a losing proposition. Your points will transfer with a very poor ratio, around 1,000 points will transfer to between 200 and 400 miles. However, using Marriott’s RewardsPlus Hotel program in conjunction with the United Mileage Plus Program can reap major benefits. As you can see from the table below, your best bet would be to transfer 112,000 Marriott Rewards points into 50,000 United Mileage Plus miles. All other options give even worse ratios. However, the Marriott Rewards program has a hidden gem the RewardsPlus Hotel + Air Package. You would think you could find this option on the Marriott Airline and Travel Rewards page, but it isn’t there. You have to go to the Travel Packages page to access this fantastic deal. The RewardsPlus Hotel + Air Package gives you the option of using your Marriott points to book a week at one of the Marriott resorts and add miles to your United MileagePlus account at the same time. You can use this package with a dozen airlines, but the United MileagePlus program is the best deal. The table below shows you the number of points you would need to redeem just for a hotel room. Realistically the lower category Marriott hotels may not be places you would want to stay for a week so you would likely be staying in one of the higher point categories. Marriott Rewards allow one free night for every four nights so you can get a free night if you stay a week. Category 8 Marriott hotels and resorts are among the best in the world. You can get a week-long vacation in some fantastic destinations like Sydney, Paris, Rio or Tokyo for 240,000 points with the free night bonus. But if you choose the RewardPlus Hotel + Air Package instead, you will do much better. For 290,000 points you can get a one week stay and 55,000 United Airlines MileagePlus miles. 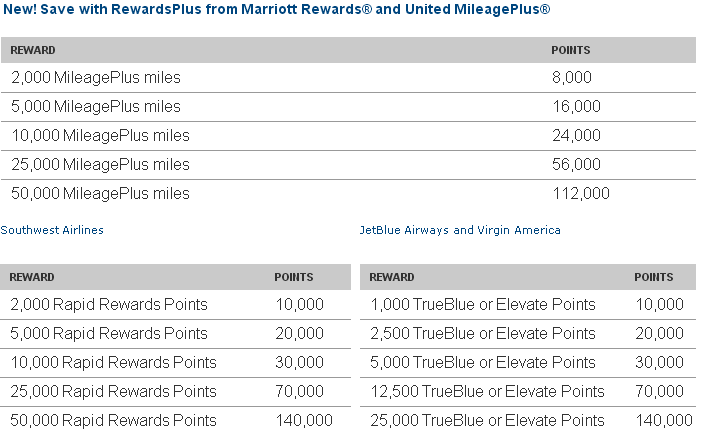 Those 50,000 extra Marriott Points are good for 55,000 extra United miles. That is an exceptional value in a the hotel-airline transfer world. If you transferred the points directly to the airline program it would cost 112,000 points for 50,000 miles. There are some restrictions. First, you have to stay seven days not four, six, or eight. Second, it’s a lot of points, and you need to have them available in your account. Marriott does allows you to transfer the points to a spouse or domestic partner to combine points and complete the reservation. In any case, this is a fantastic way to get some extra miles, especially if you were planning to stay at a luxury Marriott property with your points. It’s a great way to maximize your redemption and build your mileage account.